Caravan batteries are quite different to car batteries, so it’s important to know how to charge and maintain them properly to get the best out of them. If looked after carefully and used efficiently, a leisure battery should meet several days’ basic habitation needs between charges and will provide many seasons of service before replacement. Caravan or ‘Leisure’ batteries are designed to supply currents of a few amps for longer periods and to be discharged and recharged many times. Battery life is enhanced if it is kept well charged, so the battery should always be kept on charge if a mains hook-up is available. The battery is used to power the caravan’s 12-volt system – basically the lighting, water pump and fridge. Additional appliances can be run off the 12-volt system, but some items need the use of an inverter in order to work and will also increase the rate at which the battery is drained. Battery capacity is quoted in ampere-hours (Ah). The size of battery needed can be estimated from a combination of the length of time that the caravan will be in use between chargings, the amount of equipment in use and the length of time that equipment is switched on. To work out the capacity of battery required, estimate the number of watt hours your equipment requires over, say, 24 hours e.g. two 8-watt fluorescent lights used for 5 hours equals 80 watt hours. Divide the watt hours by 12 to give ampere hours - 80 divided by 12 = 6.6 Ah per day. So a 60 Ah battery will power two lights for nine days before complete discharge (60 * 6.6). Don’t forget to include all lights, TV, water pump and electrical appliances in your calculation. A battery will not last forever and its life will depend on how well it is maintained and how often used. Increasingly, caravan manufacturers are fitting 'maintenance free' or 'sealed for life' batteries, they have cells that have no filler caps, and which are not intended to be topped up with water. These batteries must not be overcharged since this will reduce the level of the electrolyte in the cells, which cannot be replenished. Sealed batteries should be charged with an 'automatic' or 'voltage-controlled' battery charger, which can be bought from most battery specialists, including Halfords. After several cycles of voltage-controlled charging and resting, the battery is fully charged. At least annually, thoroughly clean the battery tray, terminals and connectors and smear the latter with petroleum jelly. Unless 'sealed for life', remove the battery vent plugs or strips and shine a torch into each cell to check the electrolyte level, which should cover the plates completely. If the plates are exposed, top up with distilled and de-ionised water; never use tap water or meltwater from a 'fridge. Check with the battery manufacturer's literature regarding how much water to add. Check the battery’s state of charge on the consumer unit – usually located above or alongside the main door. If the battery is not 100 per cent charged, it should be re-charged at a lower rate for a longer period rather than at a high rate for a shorter time: do not charge at more than one tenth of the battery's capacity e.g. 6 Amp for a 60 Ah battery. If a garage is charging the battery for you, make sure it is trickle charged and not boost charged. When the battery is thought to be fully charged, disconnect the charger mains lead. Re-check the electrolyte level then leave the battery for at least four hours before checking its state of charge again. If necessary, re-connect the charger (charger mains lead last) and continue re-charging. A 75 per cent charged battery may only take a few hours to charge fully, whereas a fully discharged battery may take more than 24 hours. It is better to do this in up to 12-hour sessions than all at once. If the battery was left discharged and had been run down for a week or so, it is likely that it has become sulphated. This means that a permanent change has taken place which may render the battery totally useless. 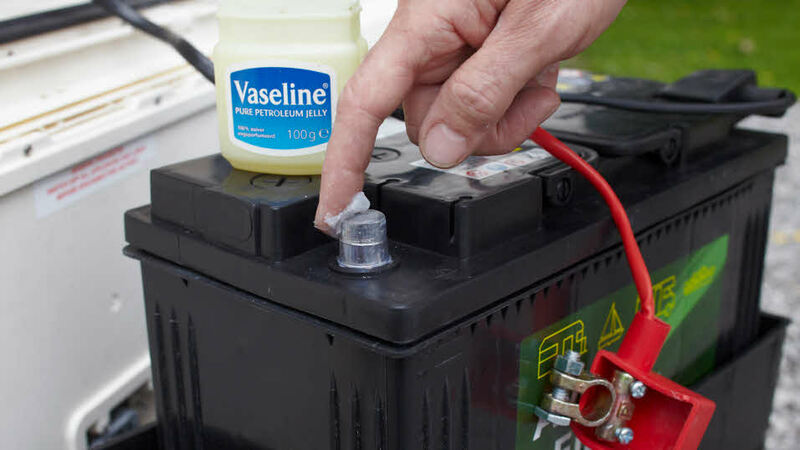 Always re-charge a battery after use and if the caravan is to be stored for more than one month, make sure the battery is removed and stored in a fully charged condition in a cool, dry place. Check every two months and re-charge if necessary to ensure long and trouble-free battery life. A battery left below 12.4 V will deteriorate quickly and will not be able to be recharged to its original capacity. If charging the battery when removed from the caravan, make sure that the premises are well ventilated. Some caravanners like to leave the leisure battery in situ and allow it to be continuously charged during winter. Ask the caravan and/or battery manufacturer first if this is appropriate, and always check the battery every month or so. Most batteries like at least a short rest period (say 24 hours) from charging for best performance. Over time, a battery will lose its charge, even with no equipment attached. Modern batteries lose 0.1 to 0.2 per cent of their charge per day at room temperature, even when new - hence a newly purchased battery may not be fully charged. As batteries age or temperature increases, so does the self-discharge rate. Caravanners used to move their leisure battery into the back of the towcar to achieve a higher charge rate from the alternator. However, the battery box used for transporting a battery to and from the car is no longer available. Health and safety considerations such as the risk of acid spillage and gas emission into the passenger compartment contributed to its withdrawal. Some owners find that they need additional battery capacity and choose to fit a second leisure battery. If considering this, make sure that there is an appropriate space for it (secure fixings to restrain the battery, ventilated to the outside, and sealed from the habitation area). Check also that you have enough payload capacity to cope with the additional weight. A second battery, if charged up before going away, will maintain a good state of charge for some weeks, and hence can remain disconnected as a reserve. Just swap it with the main battery once that one runs low. An alternative would be to wire up a manual changeover switch to allow either battery (but not both at once) to be in circuit. It is harder to set up a system where two batteries are continuously in circuit, and are both charged (by mains hook-up or vehicle alternator). In principle, two identical batteries connected in parallel would work this way, but problems could arise if there is any difference in the state of charge or the charge capacity of the batteries. Any difference could result in one battery reaching full charge before the other, and then being overcharged (with a consequent risk of damage or overheating) as the charger continues to charge the second battery. For this reason we advise that it is best to use a ‘Twin Bank’ battery charger for this application. They have two separate outputs and can thus accommodate two batteries simultaneously. They are substantially more expensive than normal battery chargers, however. While there is no danger of electrocution from a 12-volt circuit, the type of battery used for storing power for 12-volt equipment can provide, for short periods, a power output of several kilowatts. In the event of accidental misconnection, this output heats the wiring and can cause a serious fire hazard and risk of personal injury. In the event of a momentary connection, an arc can be struck which could ignite adjacent flammable material or petrol fumes, and cause risk of personal injury.